1.) Since I kept the original 1930’s honeycomb floors, I needed to incorporate the blue border into my bathroom design, plus the original cast iron tub. 2.) Restore the original built in cabinets. 3.) 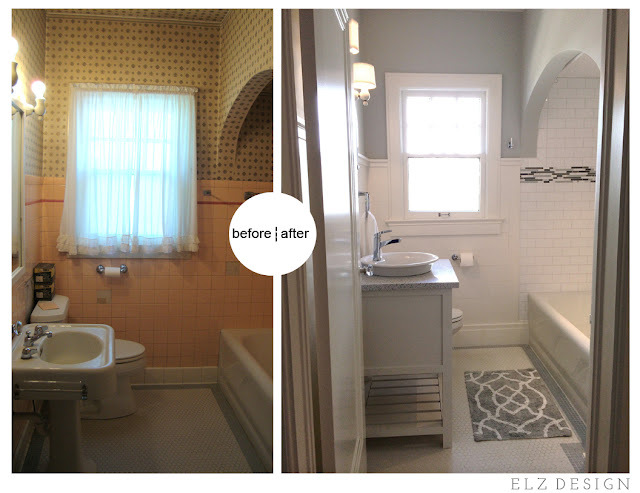 Make the bathroom appear larger while bringing more value to the space. For the wall color, I chose a softer lighter blueish/gray that compliments the blue border. For the shower, I went with a white subway tile to keep it clean and sleek with a 6” accent tile strip around the tub surround which coordinates perfectly with the wall color and the blue border. The fixtures are all new, but I did save the old bath fixtures and have a great idea to incorporate the old with the new. Can’t wait to show you! For the vanity, it was more cost effective to have the Amish custom make it with the look I wanted. Instead of doing another pedestal sink with no counter space or storage, I wanted an open look at the bottom that provides more storage but still the same size as a pedestal since the space is limited. For the vanity countertop, I used Quartz (leftover from another job, so super cheap) from Cabinets & Counters. It has the same colors as the accent tile, and the best part is the little specs of glass in it that gives off a sparkly reflection. So pretty! Topped it off with a half set on surface sink and a new faucet. Can’t have a vanity without a mirror!... Replaced that old outdated medicine cabinet with a sleek frameless oval mirror, perfect for adjusting in this situation with the wood paneling behind it. Remember those porcelain light fixtures?... Well these are the same light fixtures just changed out the light bulbs and added some shades! And lastly, took the door off of the built in cabinets, installed new knobs (same look as the original door handles), and a new fresh coat of paint. Removing the cabinet door makes the space appear larger when walking into the bathroom. To see more before/after pictures click here. For more info on installing the wood paneling click here. For more info on tile removal click here.